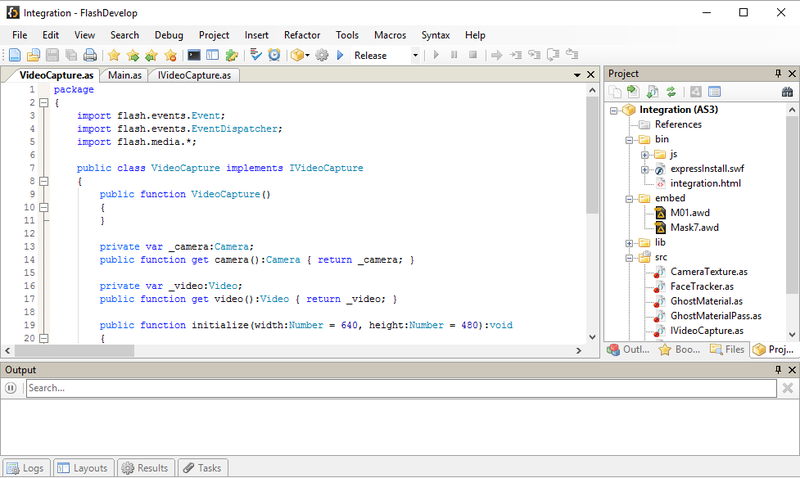 Use Native Capture: indicates if the application uses Unity webcamTexture class or the internal native video capture module provided by XZIMG (available on Mobiles). Use Native Capture: select a camera from its index (for desktop PC). Video Capture Mode: camera resolution mode (0: 320x240, 1: 640x480, 2: 1280x720, 3: 1920x1080). It is advised to set this parameter to 1 (640x480) or eventually 2 or 3 when using usb HD camera on MS Windows. Use Frontal: use the frontal camera (change only for Mobiles). Mirror Video: Mirror the video display (object positions and orientations are automatically transformed accordingly). Video Plane Fitting Mode: In case screen aspect ratio and video aspect ratio are different, you can choose to fit the video plane horizontally or vertically. Camera FOVX: Adjust the camera horizontal field of view of the camera you use. Default value is 60 degrees. Capture Device Orientation: indicates the camera real orientation (for PC). Some experiences can take advantage of mirror like portrait rendering). On PC and Mobiles, you may want to tune the camera parameters. When possible, it is recommended to reduce camera shutter as much as possible and to avoid setting too much gain (it’s always a tradeoff between these two values). High camera shutter will introduce motion blur making it difficult to detect an object when moving too fast. Setting too much gain will introduce white noise leading to possible instabilities. You can Build/Run WebGL through Unity. Just select the WebGL platform in the Build Settings window. Be patient because the build itself can take few minutes. 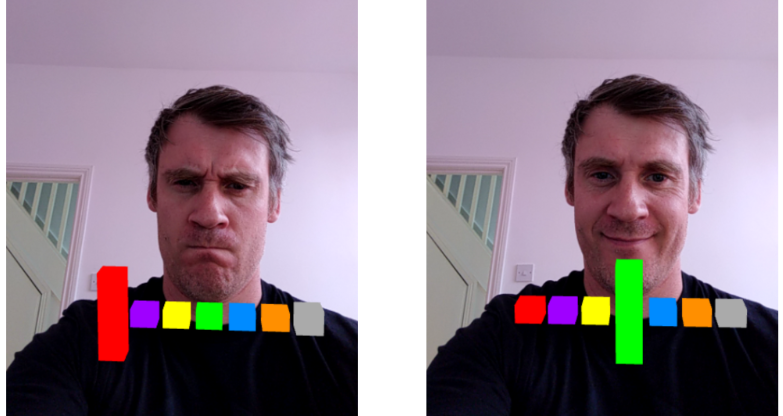 Note: Augmented Face is dependent to the HTML5 WebRTC standard to support the camera feed in real-time. Most browsers now support the Real-Time Communications (RTC). When exporting on Mobiles (Android / iOS), it is important to avoid the use of the Auto Rotation mode as the default orientation. Instead, it is best to set the device default orientation to portrait or other static values in the Player Settings section for Android or iOS. Android version of the plugin is treated using a .jar package that aims to make a bridge between Unity and the face-tracking native plugin. The native Android plugin is stored in the ./plugins/Android/libs/armeabi-v7a directory. The rigidfacetracking.jar class is stored in the ./plugins/Android/ directory and has a companion Android manifest file that will be used while compiling Android apk. iOS version consists in a static .a library that is linked with Unity using XCode. This process is done automatically when building a scene. You can build experiences for your favorite web-browser using flashDevelop. We provide a separate working sample to facilitate integration. Please note that it is not possible to use Unity Editor to create Flash based face tracking applications. Unity plugin is composed of different native library, consisting in: a couple (.so and .jar) of libraries for Android and a .a library for iOS. Each lirabries exports C like or java like functions. With certain versions of the professional version you can have access to native samples to avoid the usage of Unity and takes advantage of OpenGLES2 rendering capabilities. The remaining of the section details main functions and their signatures. The general API can be accessed by PC (Windows) Android and iOS. * Release face trackign engine. To be called before end of program. iOS has some specific API functions to handle native video capture and few specific optimizations. Android has some specific API functions (available as a Java library) to handle native video capture and few specific optimizations. The Android API is Java based and integration can be done with Android Studio (you can have access to low level native C like API as well, see Desktop API definition). There is an existing sample in the solution that will help you to understand how to inherit from the face detection main Activity. Assert that CoreImage package is added when building the application with XCode. 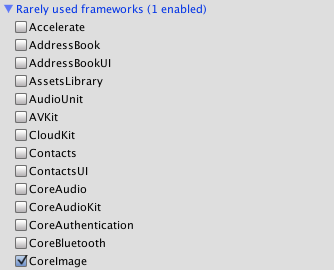 You can add this package once for all in Unity by selecting the iOS library and setting dependencies as illustrated. Please assert that you are using OpenGLES2 rendering Graphic API, the plugin background video texturation module doesn't work with other versions of OpenGLES or with Metal. The model controls a dense model which in turn is used as a support for mapping a texture. The model are available in the ./Resources directory as face-model.obj and should contain exactly 730 vertices when imported in Unity. In case one needs to modify the scenario and add new effects on top of the face, the model has to be edited in a 3D editing tool (like blender). Face model textures and texture coordinates can be modified while leaving the vertices and their orders unmodified. From Magic Face 3.0, the solution contains a segmentation engine base on recent deep learning developments. We are relying on powerful optimized RCNN (Recurrent Convolutional Neural Networks) to achieve real-time segmentation of the scene. We provide segmentation for hair and body. The segmentation is computed when calling the xzimgMagicSegmentationProcess API function. The segmentation result is obtained by calling the xzimgMagicSegmentationGetSegmentationImage API function. Different example shaders are included in the Asset/Resources/Shader/ folder. VideoShaderHairDying.shader is dedicate to dye the user(s) hairs with preselected colors while VideoShaderBodySegmentation.shader will remove the background and replace it by a transparent layer image. Note that the process of densely and robustly classify image pixels is a computationally expensive task. As a consequence, the API won't deliver real-time results for older devices. XZIMG Magic Face 3.0 provides an emotion detection engine. This process can be activated by selecting the mode in the inspector window in Unity. This process is based on a CNN (Convolutional Neural Network) and has been optimized to work on Mobile phones with limited computations. Apart from neutral emotion, it provides different expressions such as happiness, angriness, sadness, surpise. Shaders, materials and masks are stored in the ./Resources/ directory. Face classifiers (which are necessary to detect and track faces) and Deep Learning classifiers for segmentation are stored in the ./Resources/ directory. The C# scripts to launch the plugin and control its execution are stored in ./Script/. for Android a .so library and corresponding .jar java library. The main scene is provided in the ./Scene/ directory. The main scene (stored in the ./Asset/Scene directory) contains a working scenario. You will have access to an existing scene hierarchy that can run directly. You can modify different parameters to access different functionalities.